The lie detector "basically measures how nervous you are," an expert at Brandeis University said. 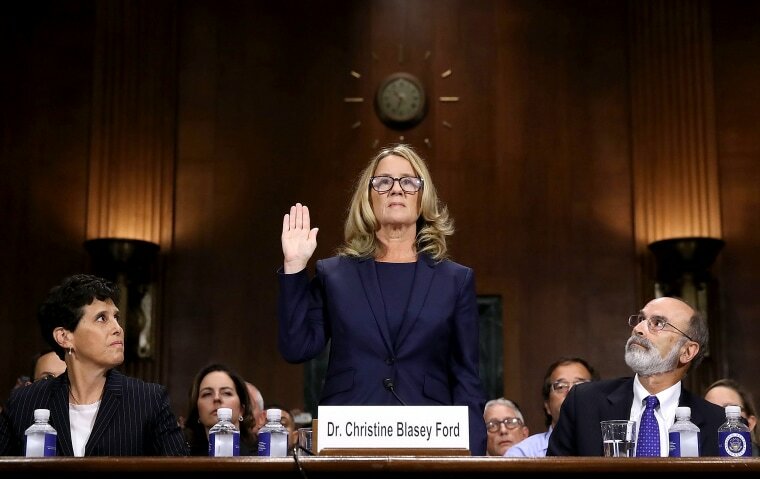 The release came six months after another high-profile allegation of sexual assault that included the disclosure of polygraph results: Stanford University professor Christine Blasey Ford's claims about Brett Kavanaugh, who is now a United States Supreme Court justice. A few months before that, allegations that adult film star Stormy Daniels had an affair with President Donald Trump also included the so-called lie detector test. Like Fairfax, the results of the examinations taken by Blasey Ford and Daniels — whose real name is Stephanie Clifford — apparently indicated that they were being truthful in their allegations. Despite the resurgence of lie detector tests in high-profile cases, the American Psychological Association says there is "little evidence that polygraph tests can accurately detect lies." The same former agent with the Federal Bureau of Investigation who administered a polygraph to Blasey Ford also tested Fairfax, Pollack said. Katz did not respond to requests for comment from NBC News, nor did Clifford’s former lawyer, Michael Avenatti. Bryan Myers, a forensic psychologist at the University of North Carolina Wilmington, said that while it was true that law enforcement agencies have relied on lie detector tests, investigators have often used them as a tool to extract confessions. “It’s convincing the person without beating them to confess,” he said. This practice wasn't limited to law enforcement. Representatives for Anita Hill, the Brandeis University professor who accused Supreme Court Justice Clarence Thomas of sexual harassment in 1991, announced that she had passed a lie detector test in an effort to "bolster the credibility of her allegations," as The New York Times put it. Saxe said little has changed with the polygraph since he started studying it in the early 1980s for the Congressional Office of Technology Assessment. Polygraphers ask the test taker a series of questions while measuring certain physiological responses to those questions. Then the polygrapher interprets those responses. Saxe speculated that the prevalence of high-tech forensic evidence in the criminal justice system and on popular shows like CSI may have played a role in the recent decisions by Fairfax and others to publicize their polygraph results. “People assume there’s a way using science and scientific devices to determine whether someone is truthful,” he said. But Myers, who has studied perceptions of polygraph results, said it wasn’t clear what kind of influence that publicity might have. Even though Justice Thomas said in the court’s 1998 decision that polygraphers and their evidence could unfairly influence juries — “clothed as they are in scientific expertise,” he wrote — Myers ran a series of studies that tested this conclusion. His research focused on jurors in a mock trial setting, and in each study he found the same thing — they tended not to trust the evidence. Even so, Myers said that the decision by someone like Fairfax to release his polygraph results could still be smart public relations.